PUBLIC NOTICE for anyone who has family or friends buried at any of our cemeteries. As we get ready for Memorial Day, we would like for you to help us by letting us know if there's anything that we can do for you! If you have a friend or loved one buried with us and for some reason, the grave is not in perfect condition, please stop by or call and let us know about it as soon as possible. If by chance your friend or loved one has an unmarked grave, we have a temporary memorial program. Be sure to ask about it. We want to make sure that your visit this Memorial Day meets your every expectation! 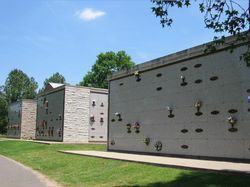 These cemetery grounds are sacredly devoted to the memories of our loved ones, all visitors are asked to conduct themselves in a manner becoming a place so dedicated. Woodlawn Memorial encourages the use of decorations for loved ones. To ensure proper maintenance, safety, & care of the Cemetery we ask that you abide by the following rules. Artificial & Fresh arrangements are permitted year round. Arrangements must be in approved vase units. EXCEPTIONS: All recent burials have a 30-day grace period for the purpose of facilitating the mourning process. All other decorations: sprays, cones, wood objects, plastic, foam, & items on wire stands will be allowed as a temporary adornment, 1 week before to 1 week after the holidays, which are Mother’s Day, Memorial Day, Fathers Day, Independence Day, and Labor Day. No personal plantings will be allowed at any time. No curbing, borders, mulching, lighting, or any decorating beyond # 1 & 2 above will be allowed unless placed in the bronze vase. The maintenance staff will remove any such improvements immediately. The Cemetery reserves the right to remove any item placed that hinders maintenance or presents a danger to the staff or others. This could include, but is not limited to, any glass, porcelain, statuary, concrete, plastic or similar substances that could break and be thrown by mowers or trimmers. Every spring and fall the cemetery will publish an ad in the local paper indicating a date, usually mid March and November, when we will remove all decorations. We will use our best discretion concerning those that appear to be recently placed, but all “seasonal” items will be removed with a waiting period of about 4 weeks before they are discarded.